If you’re traveling this year, you’ll want to have some handy apps at your disposal to help you along the way. New apps are being created daily and since the travel industry is a multi-billion dollar market, countless travel apps in particular emerge every year. Granted, not all are worthy of your time or money, but some are just too good to do without! To help you wade through the sea of newcomers, we’ve gone through the newest travel apps and compiled our top 7 favorites of the bunch. Conveniently available for both Apple and Android products, this handy little travel app is a lifesaver for anyone who has to work while on vacation. You’ll never have to worry about data charges or hunting down a free wi-fi spot ever again thanks to this crowd-sourcing app. Members all over the world can enter any free wifi spots that they find into the app (along with the password needed to access the connection) in order to help future travelers save on data charges. The kindness of strangers is amazing, isn’t it? Don’t forget to return the favor and add your finds to the database. If you’re a frequent international traveler and don’t have Global Entry, you should download Mobile Passport. You’ll fill out the same paperwork that you would in the terminal, except you’ll do it via the Mobile Passport app and get assigned a QR code that gets scanned by the agent when you hand over your passport. Not only does that process itself save so much time, but there’s even a dedicated “Mobile Passport” lane at customs strictly for users of the app to help things go that much faster! This app is available on all devices and should be downloaded before your next international flight. Sitata is a travel safety app that should be required downloading for all solo travelers visiting new countries. This app gives you safety ratings and a detailed look at the health of a country highlighting any wars, conflict, disease outbreaks and even local scams so you can steer clear. While you’re traveling, the app also gives you quick access to local hospitals or medical clinics. The app is available for Android and iPhones and the features are available whether you’re connected to wifi or not so you can stay safe at all times. This fun visual globetrotting map turns traveling into a game. You mark off places you’ve visited and the app creates a colorful world map tracking your travels. You can see what percentage of Europe you’ve enjoyed or how much more of New York you have to explore before you can say you’ve seen everything. This addictive app is available for both iPhone and Android devices. Employees that travel frequently for work will love this app. TravelBank allows an employer to set a travel budget that’s based on actual traveling costs and then the employee has the choice of how to spend that allowance. If you have a $50 transportation allowance but choose to walk during your trip, you can upgrade to a nicer dinner in exchange. And as an added bonus, if you return from your trip and haven’t depleted the entirety of funds in your traveling account, your employer can reward you through the app with gift cards to places like Airbnb or Uber. It’s available for all devices so there’s no excuse for booking your next work trip without TravelBank! 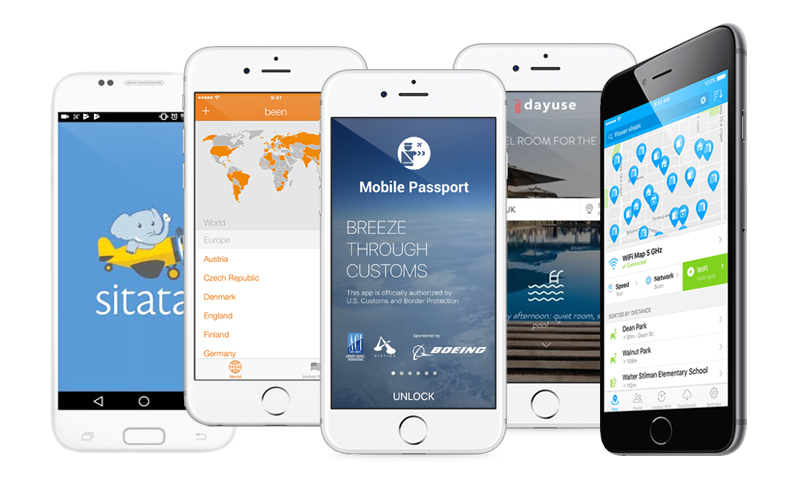 DayUse is a great travel app if you have an evening or red-eye flight. This app will scour nearby hotels that offer day rates and find ones with availability. What makes this so special? Day rates are usually super inexpensive since there’s still the possibility that the hotel can sell the room after you leave. This means that you can check into a hotel for usually less than $50 and make the most use of your time by snagging a few more hours of shut-eye, getting washed up or finishing some work before heading to the airport. For those that have trouble figuring out what to pack when flying across time zones, Packpoint has come to your rescue! Just enter your destination and dates into the app and it’ll curate a packing list specific to the local climate for those dates. If you fill out the trip questionnaire, the app will also suggest items based on your activities, such as workout clothes or sneakers if you state that you’re going hiking. The app is also completely editable so you can add your own personal items that it can’t predict for you. This handy app is available for iPhones and Android devices so anyone can have the perfect packing list at the click of a button.